Following yet another anti-Rangers sanction within Scottish football with Killie’s ticket allocation announcement, we have to laugh here at Ibrox Noise at the absolute nonsense of the situation. That Rangers supporters will only get one stand rather than two for the final match of the season, where no other visiting side will suffer the same fate completely belligerently guffaws in the face of Rugby Park’s reasons of the ‘continuing celebrations over Killie’s 150th’. Obviously, Killie only have two home fixtures over the split, but we don’t see Aberdeen’s allocation being cut or any announcement about restrictions. Put simply, this is an act in the continuing and escalating war between the clubs following Steve Clarke’s meltdown earlier this season, where he castigated Rangers fans for some naughty songs at him but barely touched on Celtic fans carrying out similar acts. This season has seen a real rise in ill-feeling between Rangers and Kilmarnock, and today’s latest episode is just a way to get one over on Rangers. Sounds paranoid, but it’s also true – if Aberdeen had also been subject to this kind of act (or indeed any side who’s visited Rugby Park this season since they turned the big 150), we’d have accepted it – petty, but fair enough. Admittedly, true, the Dons wouldn’t take half the supporters to Rugby Park, but equally we’re pretty sure home fans in Killie have been some distance off filling the stadium up. Hell, when Celtic visited a couple of months ago it wasn’t even two thirds full. No, Killie’s biggest attendance this season was the 2-1 win over Rangers, when it was significantly over two thirds full but not enough to pack it out, and today’s announcement is purely spite at Rangers. No one likes us. As per usual. I would rather we had not dealt with this in public, but with a Chairman to Chairman phone call. explain that we understand their position, but should make ours clear. If they decide to reduce our allocation, then it shall remain reduced. As many clubs are becoming concerned about the behaviour of their fans, it is in everyone's interests to have full accountability. This may mean that visiting fans are reduced to a number which is easily managed. 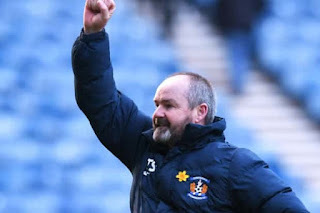 If this results in financial distress for some clubs, they can ask their own fans to rally round and support them, as I am sure Killie fans will to fill three stands. I would also note that if Killie don't need our money, perhaps they have enough to lay down a grass pitch. Got to disagree with you a tiny wee bit mate.I aint a fan of King or some of the board, however, in this case i got to stick up with them a wee bit (dont tell anyone lol). In Kilmarnocks statement re this it contained a thinly veiled suggestion aboutRa ngers fans' behaviour. That needed addressing aside from the allocation cut. If the board didn't "appear" to say anything (as the case would be with a phone call) we complain they aren't sticking up for us, when they do it in the only way we KNOW they have stuck up for us we complain or say they should't have done i like that. Can they really win? In any case, I stick stick to my guns and say I dont think fans should be buying ANY tickets for any away game. WHy the hell we continue to fund our enemies is waaaaaayyyyy beyond me. That goes for the few Rangers fans who go to Scotland games too. Why are we giving money the the SFA. Fair point Sparky. I was referring only to the ticket issue, not being aware of the attack on Rangers fans at that point. I also agree with you, when so many seem to hate us why are we filling their coffers? Our away fans also sing songs which, while they don't offend me, do offend those who wish to be offended. Refusing away tickets is one way of dealing with 2 issues at the same time. Rangers fans should not attend and let their own fans fill their boots!! I wish we had the means to sue, the SPFL & the SFA. Such obvious biases this season, just cannot be denied! If Rugby park was filled to capacity week in, week out, I'd see their arguement. However, even when we fill both stands, Rugby park is still half empty. They will already lose thousands of pounds with this decision, Killie fans won't fill it. Rangers board should keep to that allocation and refuse tickets of the second stand next season. On the day, pumping them 5-0 will soon dampen that party!